Nutrient-dense protein bars made with cricket protein. Exo Protein bars are designed to give you that extra spring in your step that you need to take on the world. Whether you’re hiking your favorite trails or simply biking home from the office, our snack bars and protein bites are here to give you the fuel you need to get through. With all the proteins, vitamins, and nutrients, you’ll have the energy for all your favorite adventures -- and thanks to the “special ingredient” in our bars, eating can be a new adventure, too! We pack every delicious protein bar with healthy fruits, nuts... and cricket protein! Crickets are one of the best sources of protein on the planet. They’re a nutritionally-balanced, delicious treat packed full of fuel -- which might be why over 80% of the world already eats them. Best of all, cricket farming is environmentally-friendly and sustainable. Crickets use significantly less water, they produce practically no methane gas, and they require less food and land than other traditional protein sources. We’ve worked with some of the best chefs in the food industry to make Exo Protein bars the best they can be. Our chefs develop new recipes with all-natural ingredients like fruits, coconut, and honey. 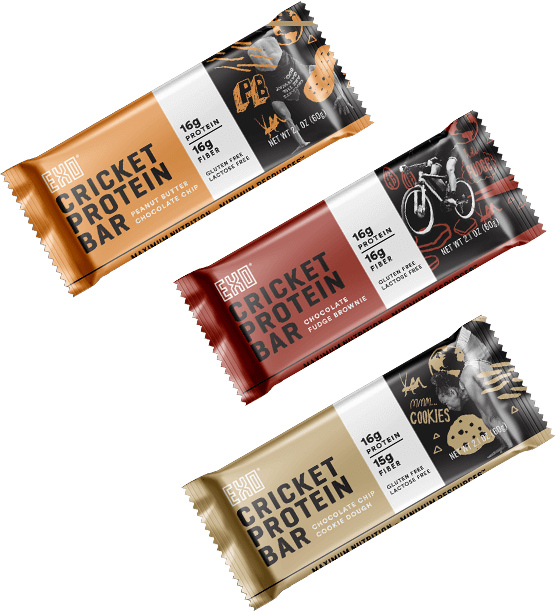 Want to join the cricket protein revolution? Now, getting your Exo Protein is easier than ever! We offer all our incredible flavors right here on our website. You can order them and have them shipped straight to your door -- or, if you’re a retailer, get in touch with us for wholesale pricing to stock your shelves. Airy, crunchy, delicious, our seasoned Whole Roasted Crickets are great to eat because they are a gluten-free, nutrient-rich, environmentally friendly alternative to the average unhealthy snack. If you want to learn more about Exo Protein and our products, please feel free to contact us here. We’re always excited to talk about the amazing benefits of cricket protein! Energy bars that put a chirp in your step. You’ll eat bugs. These investors are betting millions on it.